The policy of retesting elderly drivers was implemented for many reasons. For example, factors such as reaction time, tend to change as a person ages. For younger drivers, renewing one's license is relatively simple matter: one pays the required fee and as along as there are no suspensions, the new license is issued. However, the testing procedure for older drivers is a bit different. A number of states require than an older adult show that he or she is still capable of driving safely before a license can be issued. The person will be required to go the the licensing office in person. A vision test and/or road test may be conducted. In certain cases, staff members at the licensing office can request that the person requesting a license renewal undergo a physical and/or psychological examination. There are a number of reasons why retesting elderly drivers is important. The main reason for retesting elderly drivers for their driver's license is out of concern for public safety. No one wants to have people that are unable to drive safely on the road. In addition, if a person injured in a car accident can show that his or her injuries are the result of the Department of Motor Vehicles (DMV) failure to re-test an elderly driver, that individual may be able to sue for damages. While many driving laws remain the same year after year, changes do occur. Most people do not take responsibility to keep up with recent changes to legislation. The license renewal process is a good time to ensure that the applicant understands the present rules of the road by undergoing a written test. This is important safety consideration for both the elderly driver and other individuals who are behind the wheel. A police officer has the right to request that a driver be retested by the DMV. If your doctor has knowledge of a medical condition that may affect a person's driving, then the physician has a duty to report this fact to the DMV. Likewise, friends, neighbors, and family members are to disclose concerns about a person's driving. The individual will be asked to re-take his or her driving test to determine whether the license should be kept in good standing, restricted, or revoked entirely. The driver may be sent a questionnaire to be completed and returned to the DMV. The driver may be asked to attend a hearing. Any additional information requested by the DMV must be provided. Issue a temporary license until the medical condition is resolved. Order that the driver take a written test and/or a road test. Help is available for retesting elderly drivers. Contact a driving school in your area and ask if they have any materials to help you prepare for a written test. Instructors may be available to provide assistance, as well. If you have been asked to do a road test, consider having a qualified driving instructor evaluate your driving ability in advance. If there are areas that need improvement, you have some time to address them before test day. Being able to drive is a basic freedom that will be missed if one is unable to continue; take whatever measures you can to keep this privilege for as long as possible. 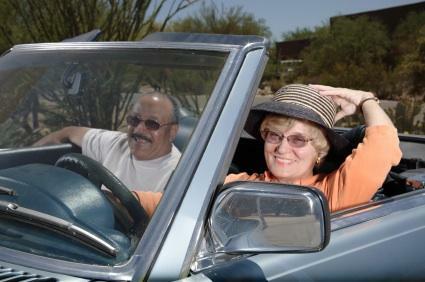 Visit the AARP website for helpful senior citizen driving tips.